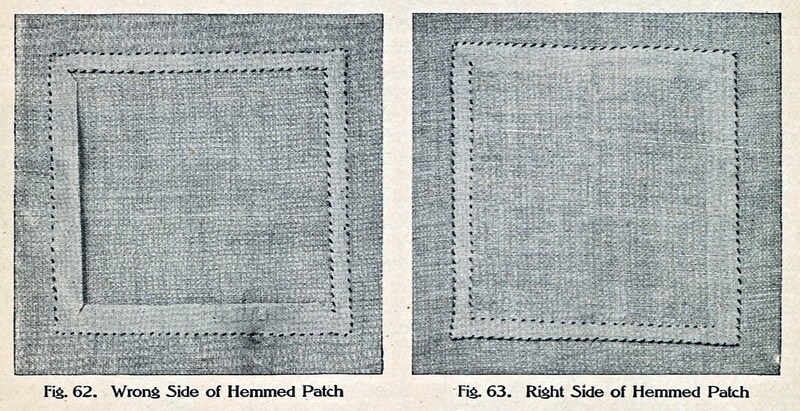 Wednesday, July 24, 1913: Did some sewing today. Hmm. . . “Sewing” is such a general term. Did Grandma do it by hand or did she use a treadle sewing machine? What kind of sewing did she do? Mending? . . . or Patching? Posted on July 23, 2013 July 22, 2013 by SherylPosted in OtherTagged family history, genealogy. Previous Previous post: Why Do Children Toil? You’re right: it could have been handwork or by machine. I’m fortunate to have the old Singer treadle machine that has been in my family for years! You are so fortunate. I can remember that Grandma had a treadle machine in her attic when I was a child. I have no idea what ever happened to it. Words contain so much – and so little – at the same time! That is a beautiful singer, Sheryl, is it yours? I really admire those sewig and handcrafting skill from earlier times. But sometimes I wonder what live would have been for those less talented? How would their wardrobe look? Unfortunately it’s not my Singer. I wish that I had one like it. You’re right–some people probably were much more talented than others at making clothes and they probably looked much more “polished” than those who were less skilled. I tend to have two thumbs when it comes to sewing–thank goodness I can just go to the store and buy lovely outfits. 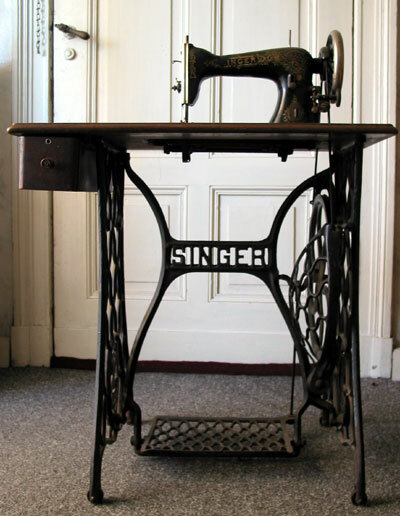 My mother had a sewing machine exactly like the one in the picture. Awesome–Treadle machines look like fun. I’d love to have the opportunity to try using one someday. I love the embroidery flowers. I do, too. 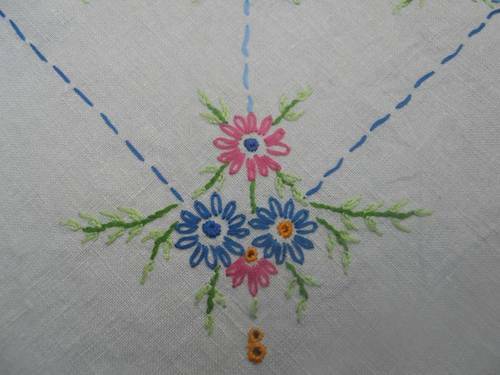 When I do embroidery I always find it difficult to be patient enough to do the stitch used to make flowers. I love the old textiles and everything related! What a great machine in that photo! Actually, I don’t remember it being too bad. Of course, I had a lot more dexterity as a kid! I can remember Grandma having a treadle machine in her attic when she was an older woman. I don’t know for sure whether her family had one when she was writing this diary–though there have been several diary entries where Grandma wrote about her mother making a dress, so I’d guess that they had one. This brings back some nice memories. My Grandma did a lot of embroidery and sewing. My Mom and Sister also would sew a lot when I was young. It seems like people did more sewing and embroidery years ago than they do now. You’re so fortunate to have learned all of these skills. I wonder? Probably wasn’t an easy job on one of those treadle machines. I was given one as a birthday gift from my ex-husband. But when we divorce it just reminded me of him so I sold it. They’re really cute though. I’d have gotten rid of it, too. Some items get attached in our memories to certain people, and it’s impossible to see the item without thinking of that person. I don’t think I would have wanted to make all the buttonholes in that dress! *sigh* Wish I could sew. I bet 18 year-old Helena would find it weird that a lot of teens nowadays can’t sew. Seems like most women (and men, for that matter) of the early 1900s knew at least the basics.